I’ve been looking for the perfect non-sweet and not-so-salty snack all my life, because let’s face it – I’m always hungry, but I don’t wanna be faaaaa. What’s the word again? I mean faaaat. I mean an elephant. Elephants are cute. You know what’s not cute – me in front of my computer, with my turtle posture, stuffing snickers and coffee down my throat and wishing I have no cellulite, but a flat belly. With some abs. But not too many abs, just slight ones. I want them to be a mystery, but not a mystery under fat. I’ve heard about a guy, who hadn’t eaten anything in three years and was only praying to the sun. And had awesome abs. Well I don’t know about the latter, I’ve never actually seen him, I’m just guessing that since he’s fasting for 3 years his abs would be showing. I admire him for being able to take the next step in evolution and make his cells produce their own chlorophyll and photosynthesize. It probably saves him a lot of time and money – not to buy and eat food. If there was a snack from air, I would buy it and eat it, believe me. 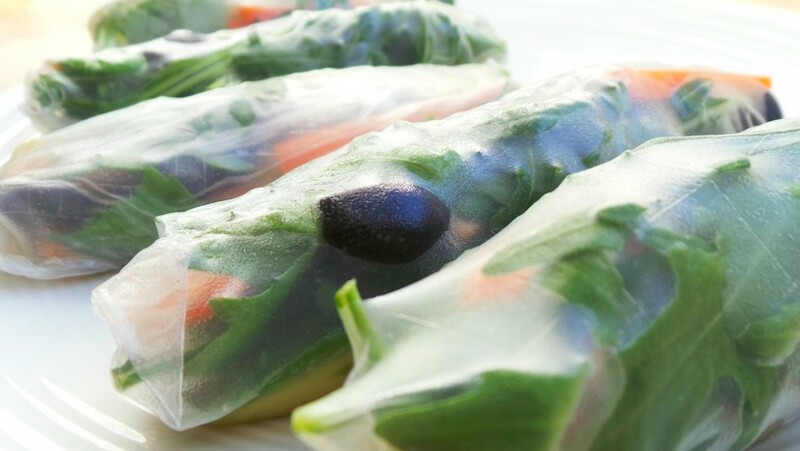 But since there isn’t such a thing I came up with these rice paper rolls. They’re vegan, gluten-free, alkaline, which means they’re practically enhanced air. These rice paper rolls are surprisingly satisfying in those moments when you’re stressed and would kill someone if you don’t have anything to eat. They will save you and others. Now I don’t have any rice paper anymore and I’ve been too lazy…no wait, what’s a fancier word than lazy, ah yes – BUSY!!! Yes, I’ve been too busy to go to the Asian shop, which is a 10 minute walk from my apartment to get rice papers from the friendly 80 years old Asian man who works there without saying a single word. Quite honestly I think he hates me. He’s always looking at me like we’re in a Kill Bill movie. And I only go to the Asian shop with the peaceful intention to buy groceries. I have never really talked to him or did anything inappropriate. Imagine if I actually asked the old Asian guy on a date, like I secretly plan to since the day I’ve met him. Maybe that’s another reason why I haven’t bought rice paper for 2 months now. All that tension. Who understands men anyway. I only understand that rice paper rolls are pretty much a perfect snack. 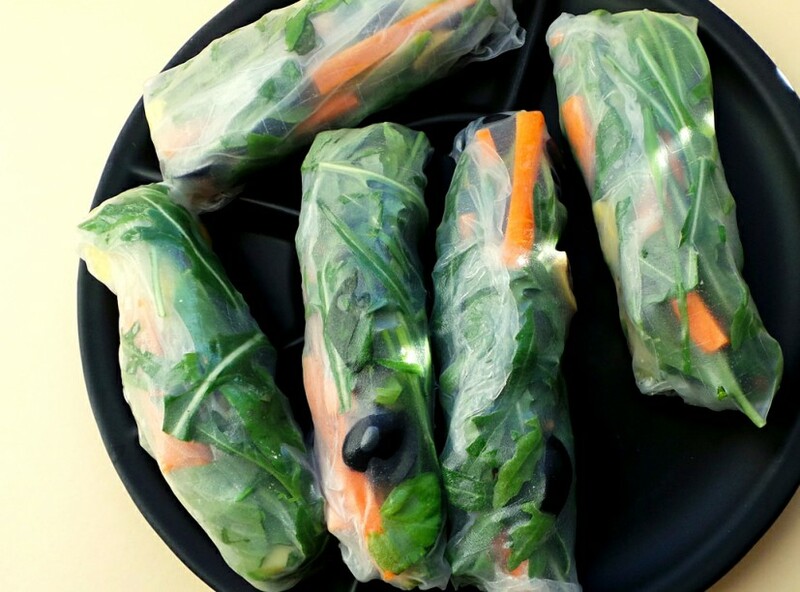 These rice paper rolls are easy and take about 10-20 minutes to be prepared, depending on how many you might want to eat. I think 2 pieces of the rice paper rolls are good as a snack, so it would not be longer than 10 minutes. If it does take you longer, it’s your fault and you’re extremely slow and should consider begging someone to make them for you. Just kidding. Seriously just try – I sucked at the beginning as well. You can’t imagine how many rice papers took a trip to the trash, and then back to my plate. Just kidding again – I don’t use plates. Time and experience made me wiser and talented-er and now I can make 5 rice paper rolls in 10 minutes, without even breaking one rice paper. Cheers to that! First peel carrot and avocado, then cut carrot, avocado and olives into strips. Chop arugula, basil and spinach. Then comes the funny part. Making those rice papers soft. You'll need to put warm water in a deep round plate, that is bigger than the rice papers. I used my baking tray, filled it with warm water and put the rice paper into the water for 5-10 seconds. The rice paper shouldn't be too soft or too hard because it would break. So just keep it for 5 seconds in the water, make sure the whole surface is covered with water, take out and it should be good. Put the wet rice paper on a plate. 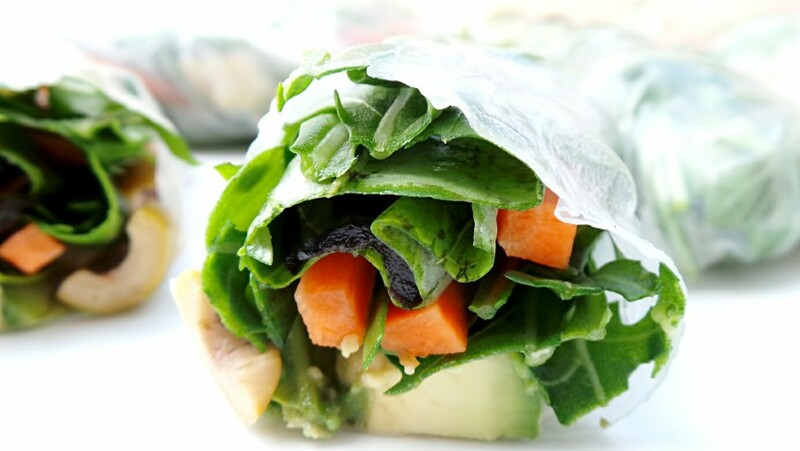 In the middle of the rice paper start arranging the vegetables in proportions - a little bit of spinach and arugula, some basil, a little bit of carrot, avocado and olives. Make sure you don't overfill it, otherwise you would not be able to close the rolls and it would be a rice paper mess, not a rice paper roll. After you have everything in the middle roll the rice paper into a spring roll. And you're ready with the first one. For the next ones don't soak the rice paper in advance - it will fall apart. Repeat as much as you want, maybe 5 times? Omg, you are hilarious! I seriously can’t eat the rice rolls because they remind me of cacoons, but next time I am craving a snack, I will just come read this blog again and distract myself until the moment passes. I think you missed your calling…unless you are already a standup comedian. In that case, good on ya! !